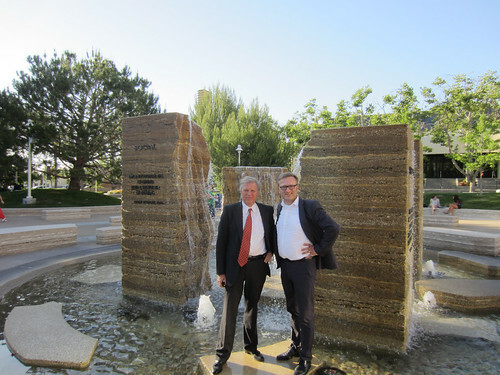 Chapman University’s MBA Travel Course “Business in Scandinavia” was founded in 2010 by professors Clas Wihlborg and Niklas Myhr pictured above. The 2018 version of Business in Scandinavia brought Chapman MBA students to Stockholm, Lycksele, Gothenburg, and Copenhagen. The 2017 version of Business in Scandinavia brought Chapman MBA students to Piteå, Luleå, Stockholm, Copenhagen, and Oslo. The 2016 version of Business in Scandinavia brought Chapman MBA students to Gothenburg, Stockholm, Tallinn, and Helsinki. In 2015, no Business in Scandinavia travel course was offered as Dr. Wihlborg and Dr. Myhr, together with their colleague Dr. Ken Murphy, managed another Chapman University travel course going to Shanghai and Beijing that summer. The 2014 version of Business in Scandinavia brought Chapman MBA students to Stockholm, Gothenburg, Helsinki, Kukkolaforsen, Luleå, Piteå and Skellefteå. The 2013 version of Business in Scandinavia brought Chapman MBA students to Stockholm, Visby and the island of Gotland, Gothenburg, and to Copenhagen. The third edition of Business in Scandinavia led by professors Niklas Myhr and Kate Karniouchina was offered during the Summer of 2012. On-campus classes were followed by a travel segment during which the group visited Helsinki and Oulu in Finland, as well as Kukkolaforsen, Luleå, Piteå, and Stockholm in Sweden. Companies visited include Kone Corporation, Rovio Entertainment (of Angry Birds fame), the Center for Internet Excellence at Oulu University, Luleå Business Agency, Vinter AB, Aurorum Science Park, Facebook’s Luleå Data Center, Meva Innovation AB, Solander Science Park, Acusticum Science Park, Böleby Tannery, Klarna Payment Solutions, and Ericsson Inc.
During the 2011 edition of the travel course, the group undertook a whirlwind tour of Finland, Sweden, and Norway. The MBA students got the opportunity to visit and meet with representatives of companies and organizations such as Nokia, Ericsson, ABB, H&M, Trygga Hem, Saab Aerospace Systems, AstraZeneca, DB Schenker, Volvo Cars, Telenor, Invest Sweden, Aalto University School of Economics, and Bank of Finland. In the inaugural edition in 2010, the group explored Denmark, Sweden, and Finland.